This is a super simple, no-bake keto friendly dessert that should be part of your regular meal prep routine. Make it with blueberries, raspberries, or blackberries if you prefer those over strawberries, or go ahead and do a pretty mix. If you are eating keto I highly recommend investing in a Kitchen Aid stand mixer to make making whipped cream something effortless you can do a few times a month. There is nothing like to taste of fresh vanilla whipped cream. I always make mine while I'm cleaning up the dishes from dinner on Monday evenings. Buy organic strawberries. If you want to wash them, allow them to completely dry before destemming and quartering them, or your strawberries will be watery. Allow the strawberries to sit at room temperature in the simple syrup so that the flavor develops and the juices run. Using the vanilla bean powder is optional, but I highly recommend it because it imparts an even better vanilla flavor to the whipped cream, and also gives the whipped cream those lovely dark vanilla bean flecks. you can use vanilla bean powder in your keto vanilla ice cream, too. Try tossing some stevia sweetened Lily's chocolate chips over the top. The best price you can find these is from Thrive Market. Pour quartered strawberries into a serving bowl & drizzle with 1-2 TBS. of simple syrup. Mix well with a spoon until evenly coated & they have the desired sweetness. Set aside. Serve the sliced strawberries with the whipped cream immediately in bowls, or you can layer the strawberries with the cream in clear parfait glasses for a pretty presentation. Store the whipped cream & strawberries covered tightly in the refrigerator until ready to serve. Allow the strawberries to come to room temperature before serving. Recipe yield 4 cups of whipped cream and 5 cups of strawberries. Note: Heavy whipping cream approximately doubles in volume when whipped, so 1 pt. (2 cups) of whipping cream will yield about 4 cups whipped cream. A serving size equals 1/2 C of strawberries + 1/2 C of whipped cream. All the products I recommend from Amazon can be found on my Amazon Products List – click here for convenient one-stop shopping. 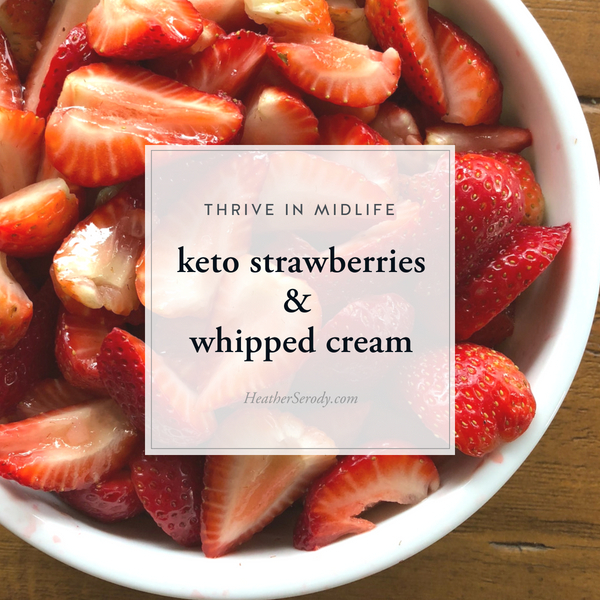 To save 25%-50% off Amazon & retail prices for your keto pantry supplies, I recommend shopping through Thrive Market.